According to the EPA, currently registered influenza A virus disinfectant products – including PuraCleenRx Disinfectant Spray and Xtreme Cleen – will be effective against Swine Flu (2009-H1N1 flu strain) and other influenza A virus strains on hard, non-porous surfaces. These products contain benzalkonium chloride as an active ingredient. Click here to read the U.S. EPA’s announcement on disinfectant products effective against 2009 H1N1 flu virus. The 2009-H1N1 flu (also commonly known to the public as Swine Flu) is a new influenza virus causing illness in people. While there is no cure for Swine Flu, you can lesson the risk of acquiring the Swine flu virus by stopping the spread of viruses on hard surfaces before you get in contact with it. The 2009 H1N1 virus is contagious and is spreading from human to human. The “swine flu” is a genetic reassortment of the H1N1 virus that contains elements of swine, avian and human influenza. PuraCleenRx Xtreme Cleen is neutral disinfectant that is effective against a broad spectrum of bacteria, is virucidal (including HIV-1, HIV-2, HBV and HCV) and inhibits the growth of mold and mildew and their odors when used as directed. PuraCleenRx Disinfectant Spray is a ready-to-use spray intended for use on hard non-porous surfaces in hospitals, healthcare facilities, schools, offices and other public places as well as in homes; and is effective against influenza A viruses, including Swine Flu influenza A (H1N1). Respiratory illnesses attributable to Pandemic 2009 H1N1 are caused by influenza A virus. 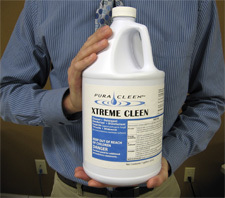 These products (Xtreme Cleen and Disinfectant Spray) are broad-spectrum hard surface disinfectants that have been shown to be effective against (influenza A virus tested and listed on the label) and is expected to inactivate all influenza A viruses including Pandemic 2009 H1N1 (formerly called swine flu). These products (PuraCleenRx Disinfectant Spray and Xtreme Cleen) have demonstrated effectiveness against influenza A virus and are expected to inactivate all influenza A viruses including Pandemic 2009 H1N1 influenza A virus. Do you worry when the next virus or cold will put you out of commission? Can’t afford to miss another day of work because of the latest bug going around? Do you find yourself afraid to touch a door handle or pick up the coffee pot for fear of who touched it last or what “bug” they might have left behind? Recent outbreaks of staph infection or avian flu prove that there is much more to worry about than just a common cold. The best defense against these harmful microorganisms is prevention. You can’t lock yourself in your home for the rest of your life just to avoid germs. 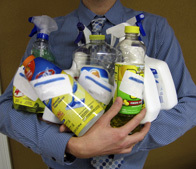 The solution is simple – cleaning and disinfecting your environment is the answer to avoiding these harmful microbes. PuraCleenRx™’s full line of cleaners and disinfectants will put your mind at ease in knowing your environment is free of harmful microorganisms. These hospital grade formulas can keep your environment clean and germ free while saving you up to 95% of your household cleaning costs. Are you worried you might bring something home to your entire family? In an overcrowded world, the concentration of health harming microorganisms in our environment is a health threat we can no longer ignore. With Staph Infection sweeping rapidly through our nation claiming lives and wreaking havoc and recent Avian Flu scares around the world no one’s health is out of reach for these harmful microorganisms. There is no need to worry any further about these harmful bacteria and viruses because XTREME CLEEN™ and our Disinfectant Spray have the power to target and eliminate these microbes from your environment while surpasses the cleaning power of any other products currently available on the market. PuraCleenRx™, a division of Q-Based Solutions, is proud to make our hospital-grade Antimicrobial solution of XTREME CLEEN™ available to the general public. This formulation is safe, effective and non-toxic when used as directed. XTREME CLEEN™ replaces other general cleaning supplies with value as well as quality. This hospital grade formula is great for use on floors, countertops, walls, dishes, carpets, toilets, sinks, furniture and much more. With the functions of a bactericide, fungicide, virucide, disinfecting agent and mildewstat as well as a general cleaner and deodorizer XTREME CLEEN™ can save consumers up to 95% of their household cleaning product purchases. XTREME CLEEN™ has proven effective in lab tests against even the most resistant strains of bacteria such as Staphylococcus Aureus (Staph Infection), MRSA (Methicillin Resistant Staphylococcus Aureus), HIV-1, HIV-2, Avian Flu (Bird Flu) and Influenza (Flu). With XTREME CLEEN™ you can be sure your home, workplace and vehicle are free of harmful microorganisms just waiting to plague on your health and the health of your loved ones. Seen at consumer shows across the nation, XTREME CLEEN™ is rapidly becoming a household name. As consumers across the country learn about the cleaning powers of XTREME CLEEN™, many are cleaning out the cabinets under the sink in the kitchen. They are clearing out the old products that they’ve used for years and replacing dozens of bottles with one bottle of XTREME CLEEN™. XTREME CLEEN™ surpasses other household cleaning products in quality and in price. You might wonder how XTREME CLEEN™ can save you up to 95% on your cleaning supplies. Well, it’s simple actually. With XTREME CLEEN™ you don’t pay for the water. We supply you with the cleaning power and you supply the water. The main ingredient in most any other household cleaning products is water. Other companies make industrial strength cleaner, dilute it and then sell it on the market. In fact with some products it would take up to 400 bottles just to equal one gallon of what XTREME CLEEN™ provides to the consumer at a fraction of the cost. Instead of diluting our product in water before providing it to the public, PuraCleenRx™ keeps XTREME CLEEN™ in its industrial strength formula and allows you to provide the water at home. You could dilute XTREME CLEEN™ in bottled water and still be saving on the amount of money you would spend on other products. One ultra-concentrated gallon of XTREME CLEEN™ disinfectant will make up to 64 gallons of industrial cleaning power, for just pennies a gallon! With that kind of cleaning power you can rest assured knowing that your home is free of harmful microbes. Not only does XTREME CLEEN™ beat competitors by value it also beats them in quality. Some products may only be anti-bacterial or anti-fungal; some may only claim to eliminate mildew and mold or just the flu virus, however, XTREME CLEEN™ does it all. With the functions of a bactericide, fungicide, virucide, disinfecting agent and mildewstat as well as a general cleaner and deodorizer XTREME CLEEN™ goes above and beyond other cleaners. XTREME CLEEN™ takes the place of bathroom cleaners, countertop cleaners, floor cleaners, disinfectants – it does it all! I was ecstatic to see the results I got” I recently moved into a new home and the condition the previous tenants left the house in was a disaster. The house smelled funny, had dead mice and the sinks, toilets and showers were in horrible shape. I purchased a gallon of XTREME CLEEN™ in hopes that it would do all that it says it does, and I was ecstatic to see the results I got. I began cleaning the ceilings in every room and worked my way down to the floors. I cleaned the entire house with XTREME CLEEN™ and could not be happier with this product. I could literally see it cleaning as the walls and floors changed colors in front of my face as they came clean. However, the really impressive part came when I cleaned the sink with XTREME CLEEN™. I was ready to take the sinks out of the house and replace them because they were in such bad condition – nothing would get them clean. I tried other products but none could do the job. I decided to test the power of XTREME CLEEN™ before I replaced them and see just how well XTREME CLEEN™ worked. I put the product in the sink, let it sit about 10 minutes and scrubbed all the grease, grime and residue out of the sink. My jaw literally dropped as the seemingly unsalvageable sink began to look like a brand new sink. The smell is gone from the house and the money XTREME CLEEN™ saved me by restoring these sinks, showers and toilets in the house was well worth the money spent on this product. I would recommend these cleaning products to anyone and everyone. It’s a must have in my home now. PuraCleenRx™ is constantly testing products in labs in order to provide our customers with the highest quality product possible. XTREME CLEEN™ has proven effective time and time again when eliminating harmful microbes from the environment. 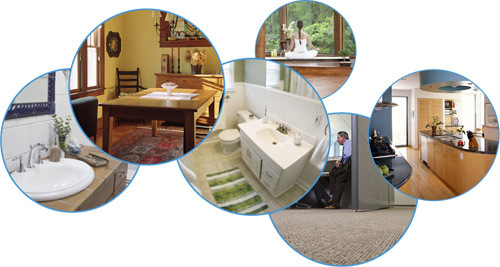 XTREME CLEEN™ gives you the power needed to keep a sanitized environment. Prevention is the key to avoiding contraction of illnesses. Begin using XTREME CLEEN™ today to start ensuring you and your loved ones a continued healthy state of mind and body. Sleep well at night knowing that your family is safe from harmful disease causing microorganisms. Unlike many other products, XTREME CLEEN™ does not contain providone iodine and alcohol which after continued use have a drying effect on the skin. Repeated use of XTREME CLEEN™ will not dry, chap or crack skin in its diluted form. In its concentrated formula, XTREME CLEEN™ is not meant do come into contact with skin. PuraCleenRx™ Disinfectant Spray is designed specifically as a general cleaner and disinfectant for use in homes, nursing homes, shower rooms, locker rooms, schools, transportation terminals, office buildings, manufacturing facilities, lodging establishments, retail businesses, veterinary clinics, pet shops, animal life science laboratories and athlete/recreational facilities and where housekeeping is of prime importance in controlling the hazard of cross contamination. It is formulated to disinfect hard, non-porous, inanimate environmental surfaces: floors, walls, metal surfaces, stainless steel surfaces, glazed porcelain, glazed ceramic tile, plastic surfaces, chrome, brass, copper, laminated surfaces, baked enamel surfaces, bathrooms, shower stalls, bathtubs and cabinets. For plastic and painted surfaces, spot test on an inconspicuous area before use. May be used in the kitchen on counters, sinks, appliances, and stovetops. A rinse with potable water is required for surfaces in direct contact with food. This general household Disinfectant Spray is ready to use without dilution. It arrives at your door ready to use. Just spray and wipe away. Our Disinfectant spray is great for use on a wide variety of surfaces. This ready-to-use formula you to spray the solution directly onto surfaces with confidence. The Disinfectant Spray targets and eliminates harmful microbes from the environment including fungi, bacteria, mold, mildew, viruses and harmful blood pathogens. PuraCleenRx™ is constantly testing products in labs in order to provide our customers with the highest quality product possible. PuraCleenRx™ Disinfectant Spray has proven effective time and time again when eliminating harmful microbes from the environment. PuraCleenRx™ Disinfectant Spray gives you the power needed to keep a sanitized environment. Prevention is the key to avoiding contraction of illnesses. Begin using Disinfectant Spray today to start ensuring you and your loved ones a continued healthy state of mind and body. Sleep well at night knowing that your family is safe from harmful disease causing microorganisms. Unlike many other products, Disinfectant Spray does not contain providone iodine and alcohol which after continued use have a drying effect on the skin. Repeated use of Disinfectant Spray will not dry, chap or crack skin.